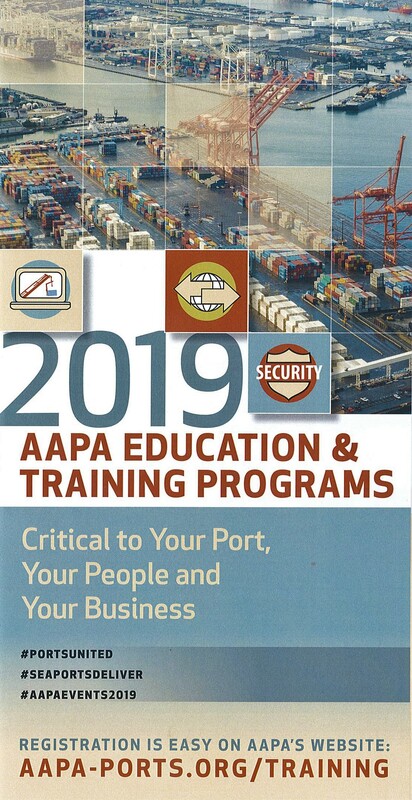 The American Association of Port Authorities (AAPA) — the unified and recognized voice of seaports in the Americas — has added an event and revised the dates of two others in its slate of 2019 maritime industry training programs and conferences. New to the 2019 lineup is the Business Development Workshop in Houston, TX (April 2-3), while the date for AAPA's biennial Cruise Seminar in Miami, FL is Feb. 20-21, and the 28th Annual Latin American Congress of Ports in Miami, FL, will be held Nov. 19-21. With the popular Planning for Shifting Trade workshop in Tampa, FL (Jan. 30-31) having just concluded (presentations from that seminar will be posted at this link), additional upcoming programs include: the Port Administration and Legal Issues seminar in Ft. Lauderdale, FL (Feb. 12-13); the association’s annual Spring Conference in Washington, DC (March 19-21); the threat prevention-focused Port Security Seminar and Expo in Philadelphia (July 24-26); the public relations and customer outreach-centered Communications and Marketing Seminar in Montréal, Québec (Oct. 28-29); and the Western Hemisphere seaport industry’s 108th Annual Convention and Exposition (Oct. 13-16), to be held in Norfolk, VA, and hosted by The Port of Virginia. AAPA’s Professional Port Manager (PPM®) class of 2023 will kick off at the week-long Executive Management Conference in San Diego, CA (May 6-10). In addition, AAPA will hold its first-ever Workforce Development Workshop in Long Beach, CA (June 25-26) to look at ways to address the challenge of filling skilled maritime jobs requiring specialized training as we face a rapidly retiring workforce. In response to port concerns about recent hurricanes, AAPA is updating and bringing back its program on Emergency Preparation, Response and Recovery. The event will be held in Corpus Christi, TX (Nov. 13-14), and focus on planning for and responding to the impacts of emergency situations ranging from extreme weather to cyber attacks that can severely impact port operations for days or even weeks. Further information about the 2019 AAPA workshop, seminar and conference programs is now available on the AAPA website. Additional topic-specific programs may be added to the AAPA website during the year which don’t appear below. Please include the above programs in your printed and on-line calendar of events.